Camden Royal Palms features beautiful one, two and three bedroom floorplans that will be a perfect fit for anyone. Our residents enjoy many amenities inside of our gated community. Take a relaxing dip in our swimming pool with a gorgeous waterfall, grill your favorite meal in our outdoor grilling pavilion or make your car sparkly and clean at our car care center. We also offer a fitness center with free weights and cardio equipment so you can meet your fitness goals. Your children will also love our playground that is only steps from your door. The onsite business center is a great place to get work done with high-speed WiFi and a printer. 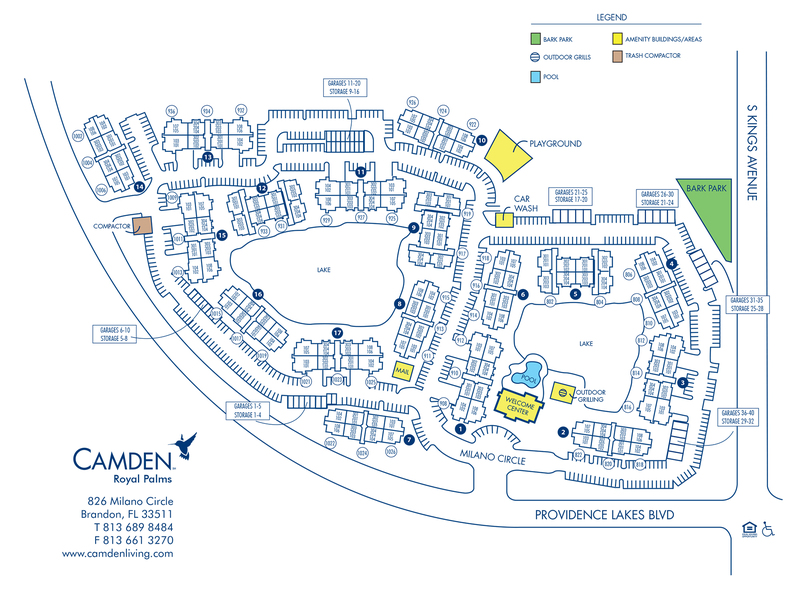 There is truly something for everyone at Camden Royal Palms. Our pet-friendly community is perfect for every four-legged friend! We are one of the few communities who allow three pets per apartment! Enjoy the day playing ball with your pooch in our fenced in dog park with a shaded seating area to keep you out of the sun. Take your pups for a relaxing walk to Paul Saunders Park or pamper your pooch at our dog washing station. Camden Royal Palms is only minutes from Banfield Pet Hospital and PetSmart where all your pet supplies are available. When you move into your new home you will love the floorplans which allow you to entertain and relax with your family and friends. Love to cook? Our kitchens include walnut cabinets, black kitchen appliances, and brushed nickel hardware. Ease yourself into our garden bathtubs after a long day at the office. Full-size washers and dryers, walk-in closets and a built in computer nooks are features you will not want to live without. Camden Royal Palms has all of your needs covered. Need more space to hold your belongings? We have extra storage spaces or attached and detached garages available. Conveniently located near 1-75 and the Crosstown Expressway, Camden Royal Palms is an easy drive for any commuter. Endless entertainment and dining options are just minutes away! Hit balls at Top Golf or ACE Golf Range, enjoy a movie at AMC Movie Theater or shop until you drop at Westfield Brandon Town Center. Enjoy a stroll and window shop at Winthrop Village or have a pint at O’Briens Irish Pub. Fun and entertainment are just around the corner. Come home to Camden Royal Palm’s, Brandon’s best-kept secret. Call today to make an appointment to see your beautiful new apartment home! Get the perfect spot! We have ample parking for our residents and visitors on a first-come, first-served basis. Residents are required to display a resident decal when parking in front of an apartment building. Visitors have access to a designated visitor parking area. Select apartment homes include attached garages and detached garages are available for $125 per month.